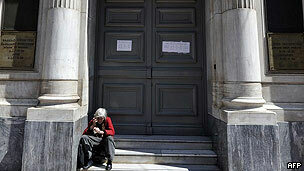 Media captionThe BBC's Mark Lowen: "It was some of the worst violence Athens had seen for months"
Greek MPs have approved a controversial package of austerity measures, demanded by the eurozone and IMF in return for a 130bn euro ($170bn; £110bn) bailout. The vote was carried by 199 in favour to 74 against. Coalition parties expelled more than 40 deputies for failing to back the bill. 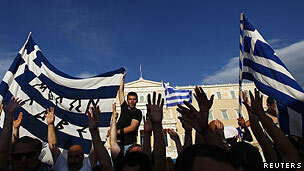 Tens of thousands protested in Athens, where there were widespread clashes and buildings were set on fire. Violent protests were reported in cities across the country. Protesters outside parliament threw stones and petrol bombs, and police responded with tear gas. Scores of police and protesters were injured. 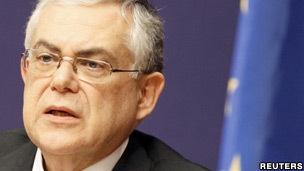 Prime Minister Lucas Papademos urged calm, insisting that the austerity package would "set the foundations for the reform and recovery of the economy". 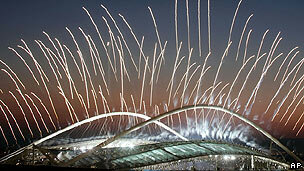 The flames have died down and the debris has been cleared by Athens authorities now well versed in post-riot clean-ups. But anger is building here and another spark could unleash yet more fury. Eurozone leaders will breathe a sigh of relief that Greece has got over this latest hurdle and the Greek government will expect vital bailout funds to start flowing soon. But many ordinary people feel that their country took another leap towards breaking point last night. The big question is when the next crisis moment will come. Is this simply kicking the can further down the road, with Greece's debt level remaining unsustainable in the long run? And will this country - will Europe - at some stage feel that the sacrifices Greece is making to stay in the euro are simply too great? "Vandalism, violence and destruction have no place in a democratic country and won't be tolerated," he said in a speech in parliament before the vote. 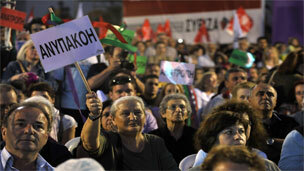 The bill passed parliament easily as the two largest parties in the coalition - Pasok and New Democracy - account for more than two-thirds of the deputies. Eurozone ministers must now ratify the measures at a meeting in Brussels on Wednesday before bailout funds can be released. The ministers rejected proposals put forward by the Greeks last week, which they said fell 325m euros short of the cuts needed. The BBC's Mark Lowen in Athens says the public are increasingly angry with the austerity measures and feel that the impact is beyond the value of the bailout. At least 80,000 people were reported to have joined demonstrations in Athens, with another 20,000 protesting in Thessaloniki. Running battles with police continued in the capital until late on Sunday, although no new clashes were reported after the vote. Protesters hurled flares and chunks of marble torn up from the square. Some had tried to break through a cordon of riot police around the parliament. Several historic buildings, including cafes and cinemas, were set alight. Ioannis Simantiras, 34, said the protesters were boxed in by police. "Nobody could get away from the gas," he told the BBC. "When it engulfed everybody, and everybody was choking the police drew back and opened up a corridor for us away from the parliament - that's when everybody made a run for it." Violent protests also spread to other Greek towns and cities, including the islands of Corfu and Crete, according to state TV. What went wrong in Greece? 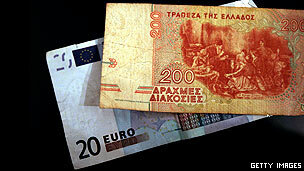 In 2010, the EU, IMF and ECB agreed a bailout worth 110bn euros (£92bn; $145bn) for Greece. 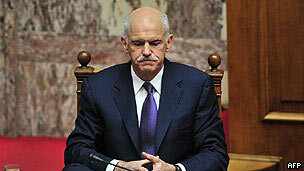 Prime Minister George Papandreou quit the following year while negotiating its follow-up. Lucas Papademos, who succeeded Mr Papandreou, has negotiated a second bailout of 130bn euros, plus a debt writedown of 107bn euros. The price: increased austerity and eurozone monitoring. In May 2012 elections a majority of voters backed parties opposed to austerity, but no group won an overall majority resulting in political deadlock. Fresh elections have been called in June. Finance Minister Evangelos Venizelos said the question was not "whether some salaries and pensions will be curtailed, but whether we will be able to pay even these reduced wages and pensions". "When you have to choose between bad and worse, you will pick what is bad to avoid what is worse," he said. Greece needs the bailout the make its next repayment on its huge sovereign debt. If it cannot make the payment, it will default and in effect become bankrupt. Analysts say such a "chaotic default" could endanger Europe's financial stability and possibly even leading to a break-up of the eurozone. As part of the deal with international lenders, Greece will also be able to write off 100bn euros of privately held debt. Earlier this week several ministers from the coalition government, including two from Pasok, quit in protest at the measures. The leader of the far-right Laos party, the junior coalition member, announced his 15 deputies would not back the austerity measures. George Karatzaferis complained that the measures amounted to Greeks being "humiliated" by Germany. The eurozone bloc has demanded "strong political assurances" that the packages will be implemented regardless of which party wins a general election due in April.